The 3/8" Sterling Grabline rope is NFPA 1983,2012 certified. Rope has a tensile strength of 3,282 lbs. and the sheath has a raised pattern for excellent gripability. Two reflective bands and an elastic "holster" for a "chem light", enhance visibility in low-light rescues. 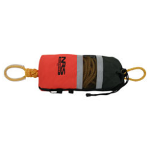 1" webbing with side-release buckle secures the top rope loop and lets you attach the bag to D-rings, boat, etc.